NICHOLS / HOLIDAY: Lady sings the blues (2'38”). B. Holiday. GRAINGER / ROBBINS: It ain't nobody's business if I do (2’34”). B. Holiday. HOLIDAY: Billie's blues (3'20”). B. Holiday. GREEN / HEYMAN: Body and soul (2’42"). B. Holiday. HERZOG / HOLIDAY: Don't explain (2'29”). B. Holiday. KERN / HARBACH: Yesterdays (1’19”). B. Holiday. CLARE / BEE PALMER: Please don't talk about me when I'm gone (1'43”). B. Holiday. FAIN / KAHAL: I'll be seeing you (2’28"). B. Holiday. POLLOCK / YVAIN: May man (3'13”). B. Holiday. FREED / ANHEM / LYMAN: I cried for you (3’09”). B. Holiday. HOLIDAY: Fine and mellow (3'15”). B. Holiday. GREEN / HEYMAN: I cover the waterfront (3’46"). B. Holiday. WOODS: Oh what a little moonlight can do (2'52”). B. Holiday. SIMONS / MARKS: All of me (2’09”). B. Holiday. GRAINGER / ROBBINS: It ain't nobody's business if I do (2'46”). B. Holiday. HAMMERSTEIN / ROMBERG: Lover come back to me (2’06"). B. Holiday. POLLOCK / YVAIN: My man (2'53”). B. Holiday. HOLIDAY: Them there eyes (2’11”). B. Holiday. DAVIS / SHERMAN / RAMÍREZ: Lover man (3'11”). B. Holiday. ARLEN / KOEHLER: Stormy weather (3’41"). B. Holiday. DAVIS / SHERMAN / RAMÍREZ: Lover man (2'58”). B. Holiday. HAMMERSTEIN / ROMBERG: Lover come back to me (1'54”). B. Holiday. GREEN / HAYMAN: I cover the waterfront (3’48”). B. Holiday. POLLOCK / YVAIN: My man (3'16”). B. Holiday. HOLIDAY: Fine and mellow (3’44"). B. Holiday. GERSHWIN: The man I love (3'04”). B. Holiday. REDMAN / RAZAF: Gee baby ain't good to you (2’20”). B. Holiday. SIMONS / MARKS: All of me (1'56”). B. Holiday. HOLIDAY: Billie's blues (3’46"). B. Holiday. GRAHAM / REICHMER: You better go now (2'56”). B. Holiday. DONALDSON: You're driving me crazy (1’30”). B. Holiday. JONES / SYMES: There is no greater love (2'34”). B. Holiday. GREEN / HEYMAN: I cover the waterfront (3’25"). B. Holiday. DeLANGE / ALTER: Do you knw what it means to miss New Orleans? (2'18”). B. Holiday. HERZOG / HOLIDAY: Don't explain (2’34”). B. Holiday. GERSHWIN: I loves you Porgy (2'34”). B. Holiday. 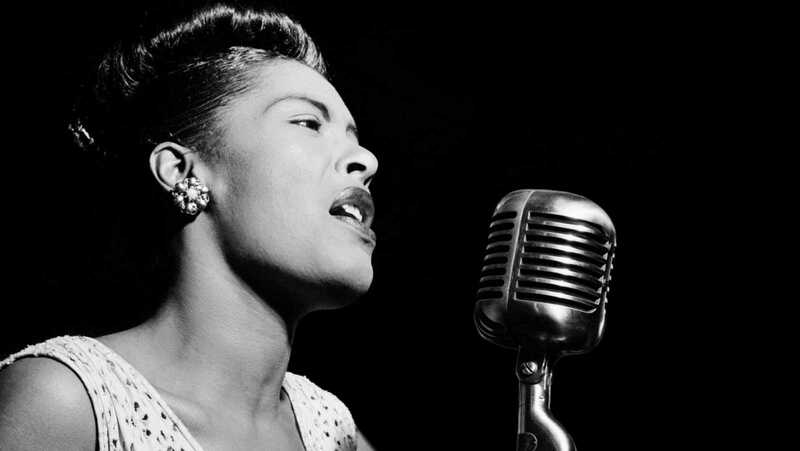 ver más sobre "Solo jazz - Billie Holiday en el Carneggie Hall - 11/04/16" ver menos sobre "Solo jazz - Billie Holiday en el Carneggie Hall - 11/04/16"